Sara Runs This Weigh: Going Strong! This week, I'm finishing up week 5 and starting week 6 of the Shred Diet. I've been going strong with sticking to the diet as prescribed in the book since midnight on the 1st...so today made 8 days!!! I'm feeling pretty good too. I've been getting my exercise in and they've all been quality workouts. Sunday, I helped Mark do the initial setup for his blog so that he'd have everything ready for starting on Monday. After everything settled that night, I got on my blog and started looking for new gadgets and widgets to add that would be beneficial for my blog and my blog followers...and for me too. I joined The Daily Mile the other day. With my membership on there, it gives me all sorts of widgets that I can add to my blog here on Blogger. I chose one of the total miles run counters to display. I was going to add the Race Schedule widget too, however, all of the races I'll be doing this year don't have a profile on the site, so I can't add them to my schedule. I emailed customer support in regards to how I might be able to create profiles for the races I intend to do, but I doubt I'll get an answer. So, no Race Schedule widget...boo! Then I decided a weight loss ticker would be nice to have, so I found one of those and added it top center. While I was searching for a weight loss ticker, I stumbled on the body % calculator widget and just HAD to have that! I plugged in my numbers and it seems pretty accurate (I base this on what the trainer at the gym measured my body fat % at a few months ago). Obviously, it's not going to be spot on accurate...you should use a caliper for that, but it's great to get a quick estimate. Anyway, me adding some helpful and cool widgets to my blog turned into me wanting to update the color. I went into the template customization and started clicking on things. I hit "apply to blog" at least once before I realized that I didn't know what settings my blog were at to start with. Then, I tried to find what I had started with and utterly failed. So, then I set about making my blog look better and I think I succeeded with that effort. Ha! I've been told already that it "flows" better and I agree. I think it's easier on the eyes as well. You may have noticed the picture just underneath the total miles run widget on the right-hand side of my blog. It's my race schedule for the year...so far. It's from an app on my phone and I like it. I realized on my way to work the other night that I forgot to include that 15K I ran last year in July for this year. Of course, there are also 2 other races that aren't on there yet because the dates for the them aren't posted on their websites yet...that's the Run With The Heroes 5K and the Brown Santa 5K. So, there will be 3 more races on there eventually. It's called My Race Calendar. Monday was my trainer workout with Samy. For the first round of exercises (the 30-ish minutes of the hour) he had me do the jump rope (as usual) for 1 min, medicine ball slams for 1 min, kettlebell squats on a large tire x15 reps, kettlebell walking lunges one way and "farmer walk" back to the start, then super low squats on my toes using the TRX straps. After that was suicide sprints and then what i'm going to call a kettlebell swing and hop. Then my 10-15 mins of kickboxing, then abs to finish up. The abs were easy this time. 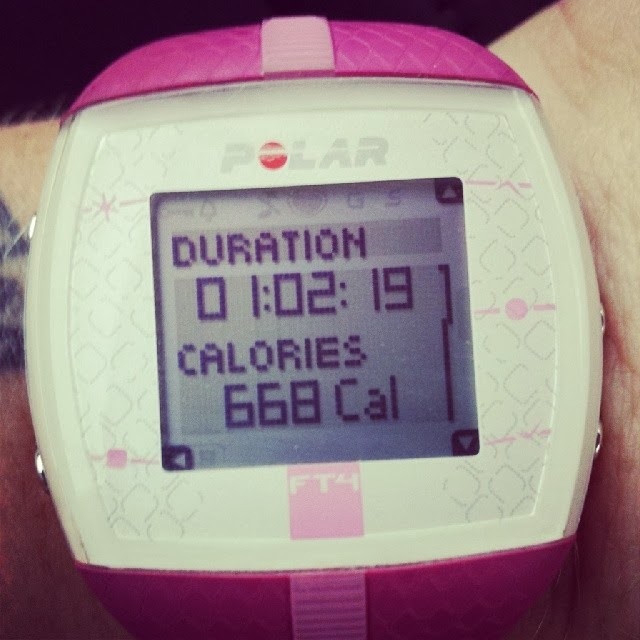 But, I burned about 668 calories thanks to it being legs day. When I got my food ready for Monday night's shift at work, I forgot to season my pinto beans with my absolutely favorite spice in the world: cumin, so I had to make due with pepper. Damn. Monday was days #6 in a row of eating "on diet." Hooray!!! I'm well on my way to losing the 7 pounds I want to lose by the end of the month. Yesterday was spot on as far as eating is concerned. Thank goodness I had already made up and portioned out my food for yesterday on Monday when I was getting everything set up for Monday night. So, I had originally only been scheduled to work overtime on Monday and Saturday nights this week. However, while working Monday night, I got asked to work overtime last night as well. I can't say no. It's just no in me to turn down overtime I'm fully capable of working. So, that means that I did NOT run this morning, as planned. Instead, I'll be running tomorrow morning...probably gonna go for either another 4 miler or bump it up to 4.5. Then, I'll run again on Friday after my dentist appointment for a 3 miler. And that will be my 4 workouts/3 runs for the week. Also, for today's food I had to put it together really quick before heading in to work. Oh well...can't win them all, right? But, I continued my steak and have now been eating "on diet" for 8 days!!! WOOT WOOT!!! Oh, and today was the very first time in my life that I have every eaten dates. Today's eating schedule called for dates stuffed with almonds. OMG!!! Soooooo yummy!!! I'm eating them again tomorrow and I'm really looking forward to them. Next week, I'm only scheduled to work one day of overtime...the 16th. That means I could potentially get in FIVE workouts next week!!! Wouldn't that just be amazing?!?!?!?! I think so. But, if I just get in my 4, I'll still be happy. I in no way want to overwhelm myself with exercise again like I did last fall. 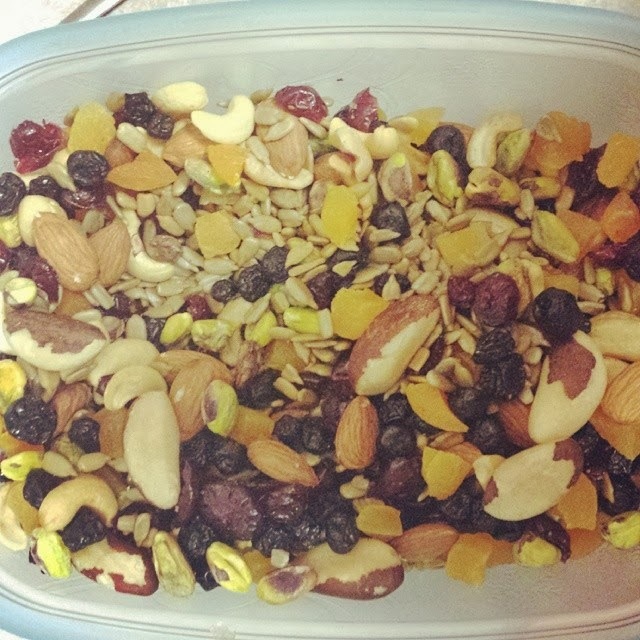 Something else I did on Sunday was make my own trail mix! I went to the Sprouts chain "farmer's market" and hit up the bulk bins. I got roasted (but not salted) sunflower seeds, shelled (unsalted) pistachios, brazil nuts, and dried cranberries, blueberries and apricots. In addition to that I had cashew halves and whole raw almonds already at the house. I mixed it all together and viola homemade trail mix! And let me tell you, that trail mix was GOOD!!! I don't know why I never made my own before. I spent like maybe $8 on all the stuff and I have a LOT of trail mix now.